1 Load of free Laundry per week included. 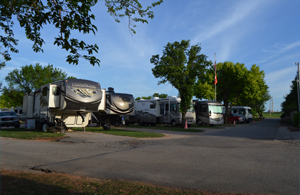 Elk Creek RV Park is a destination for both overnight and extended stay. Every RV hook up is fully accessible and the site offers free cable and Wi-Fi, a laundry mat, a sauna, a new restroom/shower building, and a 2000 square foot recreational building with full kitchen. The recreational building includes: a pool table, horse shoes, shuffle board and a covered pavilion with barbeque necessities. It offers beautiful scenery along the Elk Creek and easy access to Interstate 40. Now you can follow us on Facebook. New Bath Houses rate a 9.5 with a Star on Good Sam. Copyright 2019 Elk Creek RV Park. All Rights Reserved.